SINGAPOREANS aren’t usually given to open criticism of the Lee family that has ruled them for half a century. Rightly or wrongly, some presume that in their tightly controlled island state, walls have ears, and one never knows who is listening. But this time it’s different. Singaporeans are deeply displeased with their Prime Minister’s wife, Ho Ching. – “Lumbered with the boss’s wife”. Investment in our only natural resource, our people, could potentially have had a much higher internal rate of return, in the form of a more highly educated workforce, than that achieved by Temasek or GIC on their overseas investments. 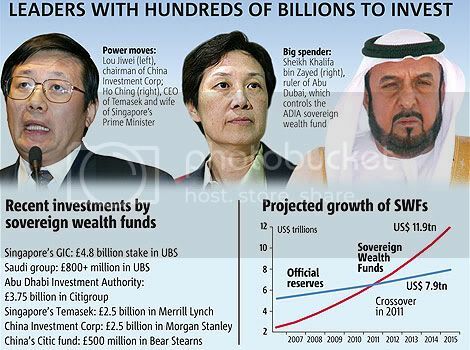 Sovereign Wealth Funds (SWFs) are not a new idea. According to Wikipedia, the term Sovereign Wealth Fund was first used by Andrew Rozanov in an article entitled, ‘Who holds the wealth of nations?’ in the Central Banking Journal of May 2005. A SWF may be broadly defined as a state-owned investment fund composed of financial assets such as stocks, bonds, property, precious metals or other financial instruments. Theoretically one can distinguish two types of SWFs. The first, and the oldest form of SWF, is one set up to manage revenues from an exhaustible resource such as oil, or one which derives its assets from government budget surpluses. An example of one based on resources, and arguably the first SWF was the Kuwait Investment Authority, a commodity SWF created in 1953 from oil revenues before Kuwait even gained independence from Great Britain. A more recent example is the Norwegian SWF which was set up primarily to ensure that the wealth represented by Norway’s oil reserves was not squandered on current consumption but turned into financial assets which would benefit future generations. 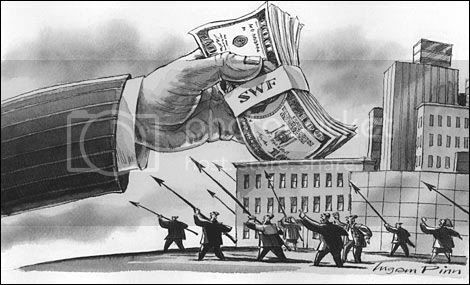 The second type of SWF is one set up to manage a country’s excess foreign exchange reserves. GIC is probably an example of this type of SWF since it was set up in 1981 with the explicit objective of managing our foreign exchange reserves for long-term capital appreciation. I say probably, as there is very little transparency, so it is not clear whether it is also funded by capital injections from the Ministry of Finance in the same manner as Temasek. However a significant portion of its funding may come indirectly from the CPF which invests primarily in debt issued by MOF. No information is available on the current level of assets. The website states only that the investment portfolio is in excess of US$100 billion. However various estimates have put the level of assets at between US$250 and US$330 billion. Again without transparency we have no breakdown of how much government saving in the form of surpluses has contributed to both Temasek and GIC’s growth over the years. But we do know that the cumulative budget surplus over the last thirty years has been considerable. The budget surplus, having been taken from the pockets of Singaporeans, then represents money that not only could have, but should have, been returned to the citizens of Singapore in the form of lower taxes, fees and charges. It could have also been used to finance much higher domestic investment in education or in health and welfare. Their website states that Temasek has achieved an annualized return of 18% since inception though that is based on the March 2008 asset figure of S$185 billion rather than on the current valuation of S$145 billion announced by CEO Ho Ching yesterday. Investment in our only natural resource, our people, could potentially have had a much higher internal rate of return, in the form of a more highly educated workforce, than that achieved by Temasek or GIC on their overseas investments. Instead of the Government investing our money to pick winners through an industrial strategy there could have been greater incentives for investment and R&D in the private sector which might have led to faster productivity growth and higher levels of real incomes. And even if GIC has not been funded directly by the MOF, the growth of our foreign exchange reserves has come about through chronic external surpluses which represent domestic under-consumption and under-investment. As a final ignominy, CEO Ho Ching announced on July 29th at the Institute of Policy Studies that Temasek was thinking of allowing Singaporeans to co-invest alongside Temasek sometime in the next ten years. How kind of her. I thought we had already invested as outlined above. The only positive side of this news is that it would presumably force Temasek to be much more transparent about its investment process and corporate governance. In any case any personal financial adviser (and I am not one) would not advise an investment in a company without sufficient transparency that required due diligence. As we all know, calls on the government for accountability and transparency in its sovereign wealth funds is not new. However; I would go one step further! Many of you know that I gave a speech at the Foreign Correspondents Association lunch on the 2 July 2009. In answer to a question put to me after the lunch I went on record as saying that Singaporeans should be given a direct stake in our SWFs, either through their privatization and the issuance of shares to Singapore citizens or through the explicit linkage of part of the value of these assets to the welfare of Singaporeans, as is done in Norway through the Pension Fund. To counter one possible objection that our national “crown jewels” could end up being bought by foreigners the government could retain a golden share which would prevent this happening to Temasek’s portfolio of domestic GLCs. Longer term there is no reason for Singapore to continue to run large budget surpluses over the course of an economic cycle. In conclusion whilst I will not let up on calling on our government for greater transparency and accountability into how it manages our money, I would urge it also to look at credible new proposals such as mine, rather than confining itself to the limited steps outlined by CEO Ho Ching in her speech.